These lyrics are more haunting and elegant than I expected. The speaker describes how he’s left in this suspended, dream-like state after his girlfriend leaves him. He connects to his dreams if she appears, and disconnects if she doesn’t. He closes his eyes in the dark and lets memories light his room. He visits places they frequented and projects holographic images of her. As a result of constantly being in a dreamlike state, he becomes an insomniac. After reflecting on why his girlfriend left him, the speaker has an epiphany that the center of the universe is love, life and he regrets being numb to existence. Weary of living in a dream world, he wants to break free from his haunting memories of her, but the cyclic structure of the lyrics’ narrative suggests that it’s as futile as his longing for her to return. The elegance of these lyrics lies in its wordplay. The lyrics’ wordplay reinforces its motif of weariness. One example of wordplay would be the frequent use of the verb ending and end rhyme, “gon hae” (곤 해), which is a homophone for the Korean word for weary, “gonhae” (곤해). For example, when the speaker says, “I’m smoking,” it sounds like he’s saying, “I’m tired,” since in Korean “smoking” is a homophone for “tired” (담배를 피우곤 해). To backpedal a little, this is a pop song, and in general its lyrics are derivative and formulaic. But they are more interesting than I thought they would be. 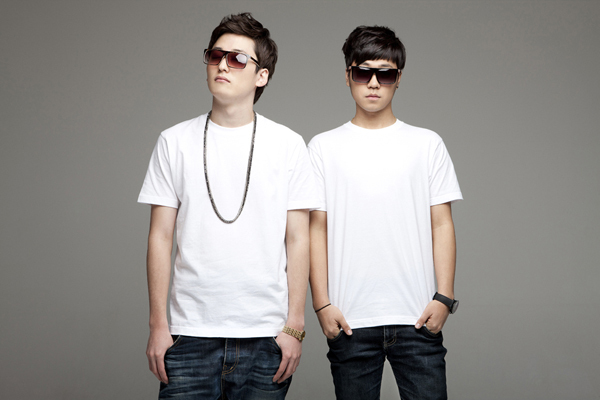 This entry was posted in K-Music, Lyrics Translations and tagged 긱스, Geeks, Geeks English Lyrics, Geeks Love Life 그 한가운데서 English Lyrics, Geeks Lyrics Translations, K-Lyrics, Korean Lyrics, Kpop, Lyrics Translations, Translations on August 30, 2013 by Justice. – Romans 3:9-18 (paraphrased), referenced in The Big Dipper. Synopsis: A man is on his way home to his sick daughter when a series of unfortunate events occur. A pile of dead bodies is found on the ship and the criminals onboard escaping to China blame the protagonist. Through various flashbacks, the mystery is unraveled. This entry was posted in Favorite Posts, K-Drama/ K-Film and tagged Jo Jae Yoon, Jung Man Shik, Jung Woo, KBS Drama Special, Kdrama, Kdrama Recap, Kdrama Review, Kim Ji Sung, Kim Roe Ha, Kim Soo Hyun, Lee Jae Won, Park Hyo Joo, The Big Dipper Kdrama Recap, The Big Dipper Recap, The Big Dipper Review, The Big Dipper Summary, The Great Dipper Recap on August 28, 2013 by Justice. This entry was posted in K-Drama/ K-Film and tagged character introductions, Kang Ji Sub, Kang Kyung Joon, Kdrama, Kdrama Introduction, Park Eun Hye, room for two, SBS, the room of two women, Translations, two women's room, Wang Bit Na on August 22, 2013 by Justice. You really shouldn’t watch dramas at two in the morning. You’re in this hyper awake state and your emotions are more volatile. In the quiet darkness, bathed in the glow of your ipad, everything seems a little surreal and unbalanced. And the bittersweet ending of a drama affects you more than it should. And you end up writing a review fueled by the leftover highs of those emotions. The KBS drama special, When Roses Last Bloomed, is vastly different from what I expected, which was something more maudlin and melodramatic. Instead, it has the feel of an introspective indie film. Despite its melodramatic material, the drama’s modus operandi is slice-of-life. It quietly highlights the mundane and is wonderfully slow paced. The music is minimal, the editing seamless, and the camera distanced, but not detached. And, for the most part, it keeps its grace until the end, though the quality of the writing drops. This entry was posted in Favorite Posts, K-Drama/ K-Film and tagged 내가 가장 예뻤을때, Jun Ik Ryeong, Jun Ye Seo, KBS Kdrama Special, Kdrama, Kdrama Review, Lee Jong Suk, When I Was the Prettiest, When I Was the Prettiest Recap, When I Was the Prettiest Review on August 16, 2013 by Justice. I’m so sorry for the delay in recaps. I’ve been falling behind on Empire of Gold episodes because I started avoiding watching it because every time I did, I felt guilty for not annotating and recapping. Unfortunately, writing recaps makes watching dramas more like work and less like fun. (Also, I’ve been preoccupied with tumblr lately and tumblr is a major time leech ;P) I’m still figuring out a work flow/method for recapping this series. Episode two opens with a scene of Hee Joo talking with Tae Joo in a prison visiting room. Tae Joo has been arrested for taking Pil Doo (the mob boss) hostage and possibly for attempted murder, since he intentionally crashed Pil Doo’s car. Hee Joo updates her brother on their father’s humble funeral. Their mother decided to cremate their father and scatter his ashes in the ocean, since their father grew up by the sea. She informs him that she’ll quit school and start working at a restaurant. When he remains silent, she tearfully bursts out that he promised to take care of everything: the restaurant, the house, and her college tuition. In his prison cell, Tae Joo has a dream in which his father appears and feeds him. Tae Joo apologizes to his father for his failings, but his father gently replies, “I lived 60 years of my life like a fool. And all I’ve left behind are burdens. I’m the one who’s sorry. Tae Joo, you have to win. In this world where I never won, try winning once.” When his father disappears, Tae Joo cries as though his heart were breaking. This entry was posted in K-Drama/ K-Film and tagged Empire of Gold, Empire of Gold Episode 2 Recap, Empire of Gold Recap, Empire of Gold Summary, Golden Empire, Golden Empire Recap, 황금의 제국, K-drama, Kdrama, Kdrama Recap on August 13, 2013 by Justice. The devil is in the details. I usually fast forward when I watch dramas, and true to form, I fast forwarded parts of the first episode of Empire of Gold. However, upon recapping Empire of Gold, I came to realize how significant all the details were. A brief shot of a plate of fruit and a paring knife on a coffee table before focusing on two people sitting on a couch foreshadows Tae Joo knifing Congressman Kim. An allusion to T. S. Eliot’s The Wasteland lays the foundation for imagery; slums are compared to a wasteland, and urban renewal to spring. The answer to a quiz show on the TV playing in the background is a reference to an economic theory about the rapid growth rate of developing countries. It’s gratifying to see evidence of a well-written and well-produced drama. For example, the writer and editor do an excellent job of cross cutting the two plotlines of the chaebol Choi family and the Jang family. By episode two, the seemingly unrelated plotlines get tied together and the foundation for our characters’ enmity is established. Though the two families seem radically different, certain intercutting scenes highlight the parallels between the characters, adding another layer of complexity to the characters’ relationships. On a technical level, this drama is a cut more innovative than most. The radio and television are used as vehicles for exposition. We get interesting camera angles, point of view shots and close-ups of motifs. Dialogue is juxtaposed with symbolic montages, such as Min Jae’s monologue about the city’s wasteland. Music is used to highlight dramatic irony and dissonance. For example, the background music for a scene in which viewers are aware of impending tragedy but of which Tae Joo and his sister are blissfully unaware is Suzie Kang’s “Violet Scent.” One of the song’s lyrics is, “we’re always making beautiful stories where we can laugh” (언제나 우리 웃을 수 있는 아름다운 얘기들을 만들어 가요). In accordance with the lyrics, Tae Joo makes a beautiful story; he tells his sister of his plans to rent a bigger house for them, open a restaurant for his father, and send his sister to college. Unfortunately, we know that his life is about to drastically change because at that same moment his father is caught in a burning building. In the wasteland monologue scene, the strains of Strauss’ waltz clash with a montage of violent scenes, creating dissonance between mood and imagery, demonstrating how people in positions of power can be removed from and indifferent to the suffering of the poor and weak. Another scene enhanced by music would be Seol Hee’s narration of her feud with Pil Do. Jaunty piano notes punctuate her tale and highlight the absurdity of the situation. For some reason the Korean government offered incentives for people to build churches so we see a montage of gangsters picking up bibles, building churches and plucking homeless people off the streets to fill their seats. It’s kind of ironic that one of most humorous moments in the drama so far is about a gangster using violence to steal property, but there you have it. 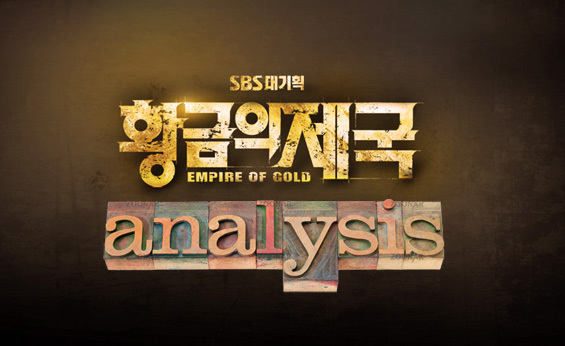 This entry was posted in K-Drama/ K-Film and tagged Empire of Gold, Empire of Gold Analysis, Golden Empire, 황금의 제국, K-drama, Kdrama, Kdrama Analysis, Kdrama Recap, Kdrama Review, Korean Drama, SBS on July 4, 2013 by Justice. Let me start out by saying this; if you’re going to sample Empire of Gold, I’d skip episode one and go for the juicy, meaty main course, episode two. Episode one is delicious, but episode two is decadent. You can read 10Asia’s short and sweet summary of episode one here. If you laugh in the face of tl;dr’s and have mastered the art of skimming paragraphs, here’s a slightly lengthier recap of episode one. There are a lot of adverbs (I get excessive when I’m excited). You have been warned (lulz). In one word, Empire of Gold is intense. It begins in medias res with Jang Tae Joo (Go Soo) stonily listening to the radio while speeding along a highway. Over the radio, we hear a female news presenter’s voice reporting that Congressman Kim Gwang Se will cooperate with investigations by the Seoul prosecutor’s office. He receives a call from Yoon Seol Hee (Jang Shin Young) alerting him that she’s finished showering and that Congressman Kim Gwang Se will be leaving for the Seoul prosecutor’s office shortly. He tersely orders her to delay Congressman Kim by sleeping with him again, ignoring the note of plea in her voice. Seol Hee stays still for a moment gazing at her reflection in the bathroom mirror before walking over to the politician and suggestively dropping her towel. This entry was posted in K-Drama/ K-Film and tagged Empire of Gold, Empire of Gold Recap, Empire of Gold Summary, Golden Empire, Golden Empire Recap, Golden Empire Summary, 황금의 제국, K-drama, Kdrama, Kdrama Recap, Kdrama Summary, Korean Drama, SBS on July 3, 2013 by Justice. This entry was posted in Favorite Posts, K-Music, Lyrics Translations and tagged Cruel City, Cruel City OST English Lyrics, 무정도시, 김용진, Heartless City, K-drama, Kim Yong Jin, Lyrics Translations, Translations on June 20, 2013 by Justice. ExifTool is one of the best programs for editing image metadata. However, it is a command-line utility, which means that it may be difficult to use for those unfamiliar with commands/CLI. ExifToolGUI bridges the gap by providing a GUI (graphic user interface) that makes many of ExifTool’s most useful features easily accessible. This entry was posted in Tech and tagged Exif, ExifTool, ExifToolGUI, Images, IPTC, Makernotes, Metadata, Tip, Tutorials, XMP on March 23, 2013 by Justice. This work by Arevolvingwheel is licensed under a Creative Commons Attribution-NonCommercial-ShareAlike 3.0 Unported License.